WELLINGTON, New Zealand -- New Zealand volunteers formed a human chain in the water at a remote beach on Friday as they raced to save dozens of whales after more than 400 of the creatures beached themselves in one of the worst whale strandings in the nation’s history. About three-quarters of the pilot whales were already dead when they were found Friday morning at Farewell Spit at the tip of the South Island. Volunteers wearing wetsuits and carrying buckets worked to keep the stranded survivors alive in an area that seems to confuse whales and has been the site of previous mass strandings. Department of Conservation community ranger Kath Inwood said about 300 volunteers had joined conservation workers on the beach. She said they had refloated some of the whales at high tide and had formed the chain to try and prevent them from swimming back ashore. Others remained alive but beached. She said volunteers were keeping the stranded survivors damp and cool by placing blankets over them and dousing them with buckets of water. The high tide allowed volunteers their one shot of the day to help some of the whales. Should the whales become stranded again, the volunteers would have to wait until the next daylight high tide on Saturday. 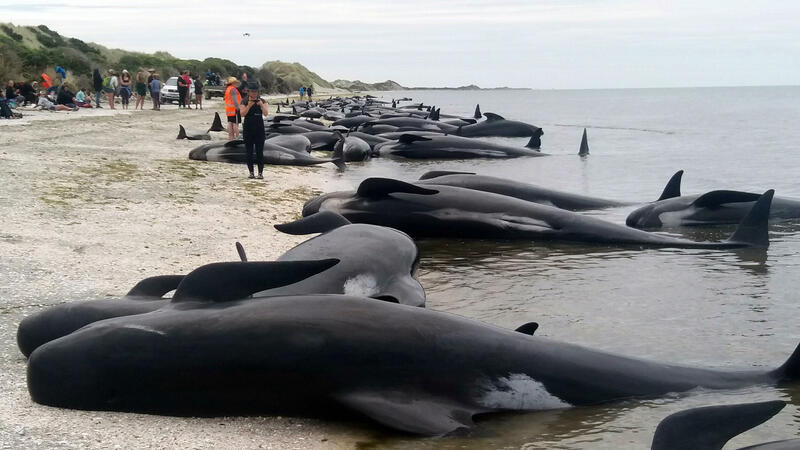 Inwood said whale strandings occur most years at Farewell Spit, but that the scale of this stranding had come as a shock. She said farmers and other locals were helping out and that people were also arriving from other parts of the country. Authorities were asking for fit volunteers to travel to the beach and help with the rescue efforts. Getting there from the nearest provincial airport in Nelson involves a three-hour drive followed by a 15-minute hike. Conservation workers said many of the surviving whales were likely to be in bad shape given the number of deaths, and that their conditions would likely deteriorate. New Zealand has one of the highest rates of whale strandings in the world, and Friday’s event is the nation’s third-biggest recorded stranding.